The general instructions to create your own dollhouse front room, living room, parlour, or den furniture are in our earlier post. But here are some more notes! 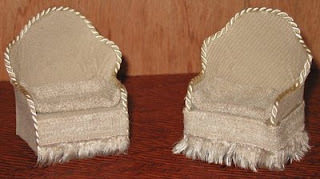 Here are three ways you can trim our no-sew doll house arm chairs, sofas, etc. 3.) Make your own trim by cutting very thin strips of coordinating or matching fabric. I recommend using a sewing glue for this type, not hot glue. 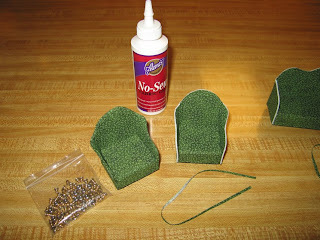 Another thing you can do to give your doll house chair, couch, or sofa a different look is glue trim around the base of it. Sometimes the raw edge of certain fabrics works great - that's what this picture is of - otherwise, experiment with different kinds of trimming and ruffles. how cute love it!! gonna try !